Guests can cancel free of charge until 3 days before arrival. Guests will be charged the first night if they cancel in the 3 days before arrival. TAXES: According to Peruvian law, foreigners travelling in Peru for less than 60 consecutive days are exonerated from IVA tax (18%) in accommodation and food services, only if they show both passport and Andean Immigration Card. Peruvians and foreigners who do not provide the required documentation will pay the 18% IVA tax. GROUP RESERVATIONS: For group reservations, we can't guarantee that the room will be exclusive for the group members or the whole group will be assigned together, but we will try our best to do it. PAYMENTS: Payments could be done in Cash in local currency (Peruvian Soles S/) or in US Dollars (US$) using the local exchange rate. We also accept Credit and Debit Cards. AGE RESTRICTION: People under 18 will not be allowed in the hostel. 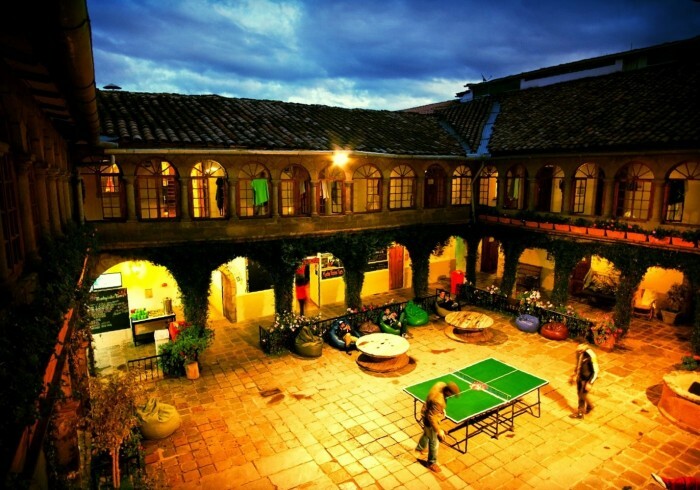 Pariwana Hostel Cusco lies in a colonial house built in the 16th century. The beauty of our hostel can be compared to any 5-star hotel in the city of Cusco, but with the atmosphere and vibe of our guests and the Pariwana experience. The house has an internal patio surrounded by stone archways in both the first floor and in the balconies of the second floor. Pariwana Cusco is located in the heart of Cusco’s Historical Center: only 2 blocks away from the main plaza. The hostel is surrounded by the typical Cusco architecture and scenery. It is nearby several restaurants, drugstores and transportation facilities.